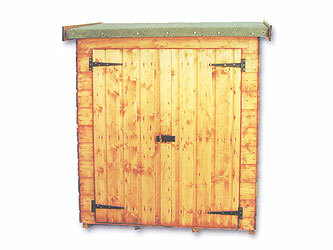 A 4' x 2'6" compact storage unit, suitable for placing against a wall or fence. Fitted with framed and braced double doors and manufactured using 12 mm tongue and grooved shiplap on 3 mm x 34 mm planed framework. Internal heights are 4'4 3/4" at the back and 4'3" to the front. Supplied pre-treated in red cedar.